A picture of Roseau Dominica, taken on September 21, 2017, 3 days after it was hit by Hurricane Maria. Photo: Jamaica Observer. Trinidad and Tobago's ambassador to the OAS, Anthony Phillip Spencer, said despite the “goodwill” expressed by the other delegations, including those from the Caribbean Community (Caricom), his country would not support the waiver, adding that Port of Spain would instead consider supporting either the “deferral of payments of contributions by member states and, where possible, the implementation of a payment plan”. 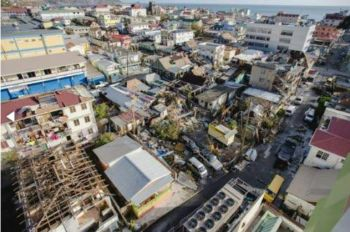 Dominica is recovering from the destruction caused by the passage of Hurricane Maria on September 18 last year, and the island had gone to the OAS meeting here last week urging member countries to approve of the waiver. The island's alternate representative to the hemispheric body, Judith-Anne Rolle, told the Special Meeting of the Permanent Council on March 23, 2018 that the post-disaster assessment situation in Dominica undertaken in collaboration with a number of regional and international organisations, including the World Bank and the Barbados-based Caribbean Development Bank, had painted a very dismal picture of the island. “The post-disaster needs assessment also concluded that Hurricane Maria resulted in total damages of US$931 million and losses of US$382 million to the productive, social, infrastructure and cross-cutting sectors amounting to 226 per cent of the GDP (gross domestic product) of 2016,” she told the meeting. She said the cost associated with the reconstruction of the country had been estimated at more than US$1.3 billion, recalling the words of Prime Minister Roosevelt Skerrit that “we have lost all that money can buy… and we would need help of all kinds”. The diplomat said that every sector of the Dominican economy had been impacted by the hurricane, a category Five storm, with the greatest loss being recorded within the agricultural sector at 33 per cent, followed by the tourism sector at 19 per cent.